In applications where air quality is essential, e.g. buildings, offices, class rooms, kitchens etc. The sensor changes its conductivity proportionally with the number of molecules of reduced gases. The associated output voltage of the measuring element is amplified accordingly from 0 … 10 V. The greater the output signal of the sensor (0 … 10 V), the worse the air quality. 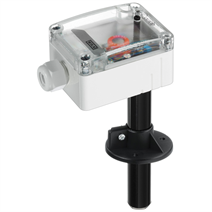 Mixed-gas sensors are broad band, meaning the result of the sensor cannot be used to conclude neither the type of the gas not its concentration. The sensor cannot differentiate between pleasant and unpleasant smells. It is the people in the area who must ultimately decide whether they are satisfied with the air quality.